Been a while since this purchase.Still using them.Excellent down pillows.Love that they are made out of cotton.Recommend these pillows! Lay your head to rest on luxurious, supreme comfort when you place these goose feather and down filled pillows on your bed. 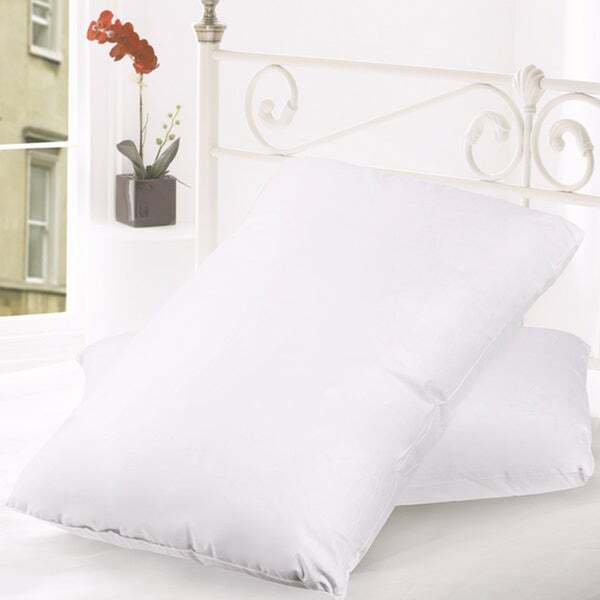 The white cotton cover features a soft 300 thread count, while the gusset edges create a sleek, rounded look that fit easily into a variety of pillow cases. Down and feather-filled products are packed tightly during shipping. Upon receipt, remove them from their packaging, fluff gently, and allow several hours to recover their full loft. In addition, being sealed in plastic packaging sometimes causes the scent of these natural products to concentrate to a disagreeable level. A few hours of airing usually removes the odor. We recommend that this pillow is fluffed at least once a week to maintain down distribution. Hard...then distroyed by month 2! Save your money! Hard and 2 months into it they are falling apart. Feathers coming out everywhere, it looks like I am killing chickens in my room...and for **** for 4 of them I expected them to at least last a year...2 months is the life span of these pillows and by that time it is too late to return them to Overstock. Highly unsatisfied with the product and the customer service. Won't be shopping here again. I attempted to return these pillows. The note next to my order states they are non-returnable. My husband & I both have been in pain since sleeping on these pillows. The feathers pop out like needles that poke into your head, neck and face. They shed so bad there are feathers all over us,our bedding, and our entire room. Today I'm cleaning up the mess and going out shopping for 2 more pillows. I've had feather pillows before and have always had good luck with them. They've done so well in the past, feather pillows had been my preferred choice. However due to this purchase I may never choose feather pillows again. I was very pleased with the quality of the pillows. They are a bit firm as there is more feathers than down, but after sleeping on them for a couple of nights, they are now quite comfortable. They are a great value and really hold their shape. I will buy them again. The only reason I did not give them an excellent rating is because the covering is a bit stuff. You need to cover them with a thicker pillow protector to make them perfect. If you do this they are a good as the $*** pillows I am replacing. I have slept on feather and down pillows for most of my life and when looking for replacements now they are hard to come by unless you want to spend a couple hundred dollars each, which I can't afford to do. These pillows are excellent. After receiving them I came back into Overstock.com and purchased quilted pillow protectors for them as the protectors pretty much keep the feathers at bay/in check. Several people had left reviews about them being stiff and crackly sounding. While that may have been true for the first few days it certainly isn't a remaining issue. If you are looking for comfort and nice support in your pillows I highly recommend these, but also would suggest you purchase the quilted protectors as well. I am totally satisfied with ALL my purchases from Overstock.com. if you want nice, soft feather pillows, these are NOT the pillows for you. i wish i'd known that before i bought them. on the other hand, if you want pillows that will POKE YOU IN THE FACE WHILE YOU ARE SLEEPING, then these are the perfect pillows for you! bonus if you love pillows that keep shedding feathers even four months after you bought them so that you find feathers everywhere in the house and somehow embedded in your clothes WHERE THEY CAN POKE YOU WHEN YOU ARE AWAKE TOO!! i guess i will use these pillows for sound insulation or something. but i think they will have to be double-wrapped in plastic to keep the feathers in because these feathers have managed to work their way through fairly thick flannel pillow cases and into our foam mattress & foam pillows & also into some fairly thick cotton fabric in our clothes. these pillows are a menace. you've been warned. Just Like Goose Feather & Down Pillows used to be! It has been a long time since I purchased Goose Feather pillows. They are such a luxury, and always wonderful for sleeping. Yes, I was concerned at purchasing online, and being unable to inspect them for quality. But I took the plunge, and the quality is perfect - exactly how I remember them! I simply, LOVE, LOVE, LOVE, my goose feather and down pillows. I usually have a hard time being comfortable with pillows, but these fit me just right! Nice pillow. Fluffs up nice, holds shape. Very satisfied. I would recommend it. Pillows smell like burnt feathers. Not sure if you ever smelt burnt feathers but I have and it's nasty. These pillows smell so bad I can't use them. I have aired them outside, used febreeze, nothing gets rid of the nasty stench. I had to throw them away. the pillow should have a extra cover or a heavier material so the smell and feathers would not come out easily or poking you in the face and the smell is very strong. I grew up on feather down pillows and there is nothing more comfortable to me. I love them. Brought this for a Christmas present. The recipient loves them. Very comfy. I really love my new pillows. I have neck pain so being able to shape these to fit is wonderful. I have tried other pillows and they just don't work as well as these do for me. Highly recommend them. 1 year later and I still love these pillows!! They have held up nicely with very few feathers making their way out of the casing and amazingly comfortable. "The description says they're gusseted, but the pillows in the pictures aren't gusseted?" Hello whatever, this item features gusseted edges. Thank you for shopping with us. I love feather pillows. And needed some new ones. "What is the percentage of down in this pillow?" Hello Ricky, fill material is: 95-percent feathers, 5-percent down. Please let us know if you have any further questions.